There are 121 stories in this book. The Storybook begins in Genesis and goes all the way through to Revelation. 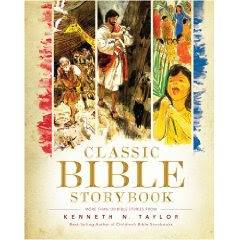 (You might recall I reviewed some Bible story books for Kids from Tyndale some time ago and I was kinda surprised at how much of the Bible some Bible storybooks seem to leave out.) I like the comprehensive type of story books as I think it will make more sense in the long run to present children with the entire word of God instead of mere snippets. That being said, I think the Bible as a whole might be a bit overwhelming to a youngster and so having it laid out in chunks, and told as if a story (which it is!) would be appealing and useful. Each story is about one to one and a half pages in legnth. Each story is wrapped up with three questions for you to discuss with your child. It's all very straightforward and to the point without being dry. It makes for an easy read with little difficulty in achieving comprehension. is quite well done. Two thumbs up to Tyndale for this one! I'm glad to have it in our home library.